Combine first 4 ingredients, tossing to coat; cover and marinate in refrigerator 1 hour. Drain in a colander over a bowl, reserving marinade. Cook broccoli florets, carrot, and broccoli stems in boiling water 1 1/2 minutes; drain. Plunge into ice water. Drain. Heat a wok or large nonstick skillet over medium-high heat, and spray with cooking spray. 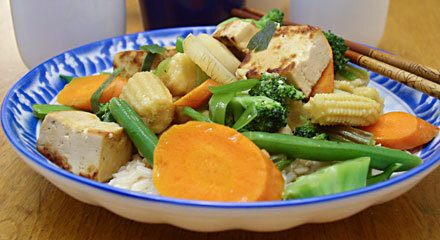 Add tofu; stir-fry 5 minutes or until lightly browned on all sides. Stir in onions, ginger, and garlic; stir-fry 30 seconds. Stir in broccoli mixture, snow peas, corn, and water chestnuts; stir-fry 1 minute. Combine broth and cornstarch, stirring with a whisk. Add cornstarch mixture, reserved marinade, and salt to pan; bring to a boil. Cook 2 1/2 minutes or until slightly thick, stirring constantly. Serve over rice.